People typically don’t pay much attention to their axles throughout the life of the vehicle. This is most likely due to their lack of understanding of how the axle works. The majority of axle components are durable and will require very little attention with the exception of maintenance work. However, many of the components in the axle endure wear and deterioration over their lifetime and will need replaced. One of the more common parts to be replaced are worn wheel bearings. These have a relatively short lifespan. It is most likely every vehicle owner will have replaced worn wheel bearings at one point in time. If you think you may need your worn wheel bearings replaced, want us to give them a health check or simply have a question about bearings, come visit us at Houston Rebuilt Axles www.houstonrebuiltaxles.com or call 1-832-280-8489. Wheel bearing construction varies with manufacturer and application. In general, they are constructed with an inner ring surrounded by multiple rollers. Rollers can be different shapes such as spherical or tapered cylindrical and are usually made of hardened steel. Surrounding the rollers is the outer ring. On either side of the rollers are the seals. 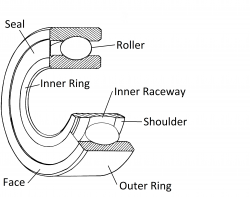 The seals together with the outer and inner rings enclose the rollers and retain a grease lubricant to reduce frictional forces on the components. Between the inner and outer ring, the rollers can rotate allowing each ring to rotate independently of the other. To hold the rollers in place, the inner and outer ring have a roller shaped groove. This is known as the inner and outer ring raceway with shoulders on either side. Worn wheel bearings are not always recognizable. This is especially the case when the drivers are not mechanically minded or know what to look/listen for. The sounds may also be hidden by a loud vehicle. Here we will discuss the symptoms of worn wheel bearings and bearing damage requiring replacement. How can I tell if my wheel bearings need replaced? Probably the most common symptom is a grinding sound from the rear while the vehicle is in motion. As wheel bearings are in use on both sides of the vehicle and act independently, single bearing failure is more likely. In this instance, the grinding can be exacerbated when turning. If the bearing on the right wheel is grinding, the sound will become louder as the vehicle turns left. If the vehicle turns right, the sound will get quieter until a forward direction is resumed. This is due to loading of the bearing. A vehicle turning left transfers more weight to its right side and thus applies more weight to that wheel and bearing. This results in the grinding sounds increasing due to more force being placed on the worn bearing. Of course weight is also transferred to the rear when accelerating which will amplify the sound but will not indicate as clearly which rear bearing is producing the sound. If the bearing making the sound is not in the hub but is the inner axle bearings positioned near the side gears, the noise may not be as significantly affected by turning. Grinding sounds are indicative of mechanical damage such as roller or raceway damage. Snapping or clicking is heard when making sharp turns. This may indicate excessive bearing end-play as a result of inadequate clamping. However, when coming from the front wheels, this may indicate CV-joint damage. Although this is usually related to brake component problems, in some instances severe bearing looseness can cause run-out. This makes the brakes pull on the steering. this is another instance when the cause is unlikely to be bearing related but in extreme conditions, a worn bearing can cause uneven tire wear.